If you need to get around the city, be it to work or college, and don't really require a car to do it, you're probably wondering which mode of transportation you should invest in. A moped maybe, or what about a motorcycle? Certainly a bicycle is out of the question, thanks to the massive amount of energy it would take to get you there, and the fact that you'll be drench in sweat before the day even starts. 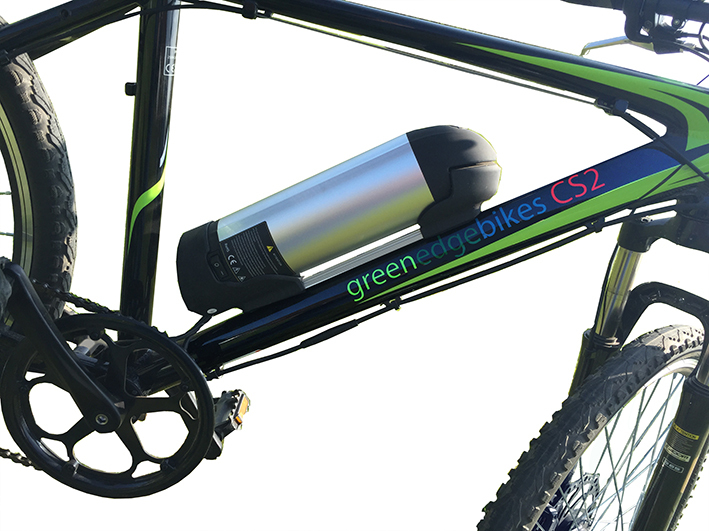 Well, not any longer... not if you get the E-Bikes GreenEdge CS2 Electric Mountain Bike. So as you can see, we're really impressed by the E-Bikes GreenEdge CS2 Electric Mountain Bike. Like we say in the video, we've always been firm road bike riders here at Test Pit Towers, but after a few weeks of exclusively riding the CS2, colour us converted! That is because the bike really does shrink your locale, far more than a traditional bike. And by that we don't mean that you just sit back and hit the throttle, letting the electric motor do all the work. Although a big novelty at first, we found that just using the motor to power us along without pedalling was great, but the power-assisted element is far more enjoyable and practical. It keeps you travelling further for longer, as the amount of energy you put in feels like it is tripled by the motor... and by God can it move! We thought road bikes were fast - they have nothing on this. Pedalling at full tilt produces - thanks to the assistance of the motor - incredible speeds which make the E-Bikes GreenEdge CS2 Electric Mountain Bike feel much lighter and speedier than it actually is. And unlike a road bike, which typically has thin grip-less tyres and narrower handlebars, the CS2 is a full mountain bike, complete with chunky tyres and firm frame, contributing to the sense that you are so much safer on it. It is also so very comfortable to ride. The seat is wide and soft and sits upon the rear suspension, while the front end benefits from fork compression suspension. As we said, we tested the E-Bikes GreenEdge CS2 Electric Mountain Bike over rough terrain as well as city streets, and never once felt uncomfortable or unsafe doing so. Seriously, if you are looking for an alternative to a petrol engine moped or bike, consider this. As a vehicle for fun and adventure, as well as for getting you around, The E-Bikes GreenEdge CS2 Electric Mountain Bike truly is the best of both worlds.